The magic number. The number 20. This analysis is obiously to put the portuguese box-office right. It was wrong for two weeks and so this week we won´t have the rise or drop of each film since last week was wrong and that wouldn´t make any sense. This week we got 209807 spectators for the top 10 movies. At the top 10 spots just two openers, "The Man" and "The Descent" that still didn´t opened in the U.S.A.
And what about the number one spot. Is it still for Kong, "King Kong"? We are considering the week between 29 December to January 4. 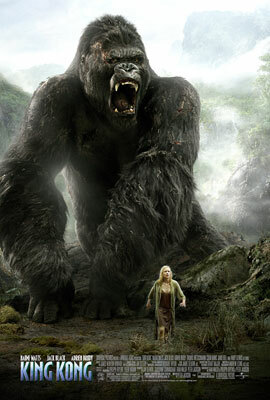 The First place goes to: Kong, "King Kong". In it´s third week of release, it managed to stay at the top spot thankfully in part due to the small openings of 5 movies. None of them was significant so it would be difficult for it to loose the number 1 spot. With 53626 spectators for the week and a corrected total at a more believable 277245 spectators. It is not 500000 but it isn´t 77000 like the numbers from last week. This one more on the good movie side opened at number 9 with 9580 spectators. "The Descent", the second best horror movie of the year (personally) didn´t raise any attention. I personally expect a top 3 spot, but i guess i got over the top. Sometimes quality is not enough. maybe because i haven´t seen a trailer or anything ressembling marketing for it... In the world today, a movie without marketing is difficult to sell. maybe the great word of mouth will help sell it. I hope so. At number 15 we wave "Waiting..." with 4142 spectators. Another one ignored in this week full of openings. There were 9 new openings this week. Too much for the portuguese market to absorve. Finally at the number 19 spot is "Joyeux Noel", a french movie about a Christmas break in World War I, to sing songs during the conflict in "No Man´s Land". A break in war in Christmas, to sing? This is almost unbelievable but they say it is a true story. Only 2721 spectators believed it to be...The tohers stayed at home, watching soap operas (ou novelas para os portugueses). E o "King Kong" bem mereceu :).